Developed in consultation with World Dressage Champion, Isabell Werth. 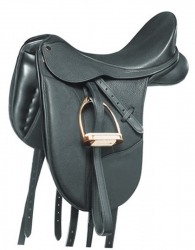 The difference the Isabell saddle makes to the rider is quite profound as radical features take the effort out of sitting in the correct position. Extra Deep Seat provides greater control and security. Newly positioned Stirrup bars effortlessly balance the rider in ear, shoulder, hip and heel alignment. CAIR® Panel System for better performance and freer movement of horse. horse&apos;s changing shape, or to fit different horses. providing extra security and eveness.